This is a new tool designed by Pantone to keep me from getting anything done this morning. I'm amazed, I have to say. Bright orange is my favorite color. I feel lucky when I wear it. 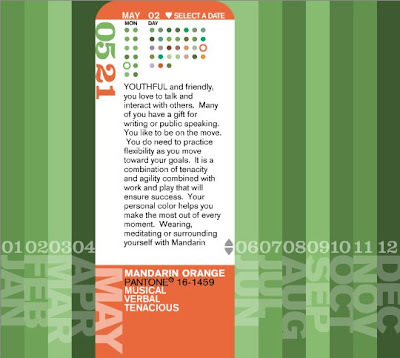 And now Colorstrology tells me wearing orange "reminds you to take action and not get caught up in the world of ideas." Gotcha. I'll put on an orange t-shirt and turn off the internet. Via the one I am stalking. I'm really upset because my color is ca-ca. It's this horrible pea soup green. I keep clicking around to shop for other birth dates so I can have a good color.